Níl Tionól Forbartha 2018 i bhfad uainn anois! An mbeidh ionadaithe ó do scoil i measc an 300+ toscaire a bheas i láthair in Óstán an Clayton, Gaillimh, ar an 16ú Samhain? An bhfuil tusa nó comhghleacaithe leat ag iarraidh breis a fhoghlaim faoin gcódú agus cúrsaí teicneolaíochta, conas dráma simplí a léiriú, bealaí praiticiúla le teanga na matamaitice a fhorbairt, an Ghaeilge lasmuigh agus laistigh den seomra ranga, acmhainní nualácha don 21 hAois, nó conas plé le scoláirí le riachtanais speisialta oideachais sa suíomh lán-Ghaeilge? Beidh ceardlanna ar na hábhair seo agus neart eile ar chlár na bliana seo. Tá scoth na gcainteoirí le bheith linn lena gcuid saineolais, taighde agus smaointe nuálacha a roinnt. Ina measc, beidh Gearóid Ó Tuathaigh, Deirdre Ní Dhorchaí, Seán Ó Grádaigh, Lydia Uí Ruairc, Frank Ó Tormaigh, Fil Uí Dhubhghaill, Monica Ní Choitir, Muireann Ní Bheaglaoich, Pádraig Ó Duibhir, T.J. Ó Ceallaigh, agus go leor cainteoirí eile den scoth. Beidh deiseanna iontacha forbartha gairmiúla ar fáil ó 09.30 ar aghaidh go 17.15, agus deiseanna sóisialaithe agus líonraithe le hiliomad múinteoirí agus príomhoidí eile le toscairí ag teacht ó scoileanna DEIS, scoileanna uirbeacha, scoileanna beaga, scoileanna Gaeltachta agus eile. Ná déan dearmad go bhfuil an fáiltiú agus mórdhinnéar ceiliúrtha san áireamh sa bpraghas le clár iontach siamsaíochta an oíche sin – lúibíní, ceol le Kíla, agus duaischarta le go leor duaiseanna den scoth a bhuachan. Tapaigh an deis agus cláraigh inniu. Is é an dáta deiridh don chlárúchán ná 12 Samhain 2018. Níl ach 40 spás fágtha againn anois! An chéad ócáid phoiblí riamh do thuismitheoirí páistí le riachtanais urlabhra, teanga agus chumarsáide atá ag freastal ar scoil dhátheangach. 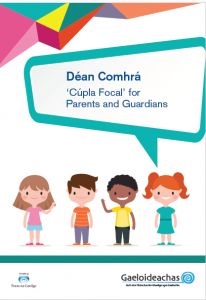 Tá líon na bpáistí in Éirinn atá á dtógáil le dhá theanga nó níos mó sa bhaile nó sa timpeallacht scoile ag méadú. Bíonn ceisteanna ag go leor tuismitheoirí/caomhnóirí, ceisteanna nach dtugtar freagra orthu go minic, maidir le húsáid an dá theanga agus oiriúnacht an oideachais dátheangaigh do pháistí a bhfuil riachtanais urlabhra, teanga agus chumarsáide acu nó riachtanais speisialta oideachais eile acu (uathachas, disléicse, diospraicse agus Siondróm Down ina measc). Tabharfaidh painéal de shaineolaithe sa réimse seo aghaidh ar na saincheisteanna seo ag oíche eolais phoiblí agus déanfaidh siad chuile iarracht tuismitheoirí a chur ar a suaimhneas gur córas tairbheach é an t-oideachas dátheangach do pháistí le riachtanais speisialta oideachais éagsúla. 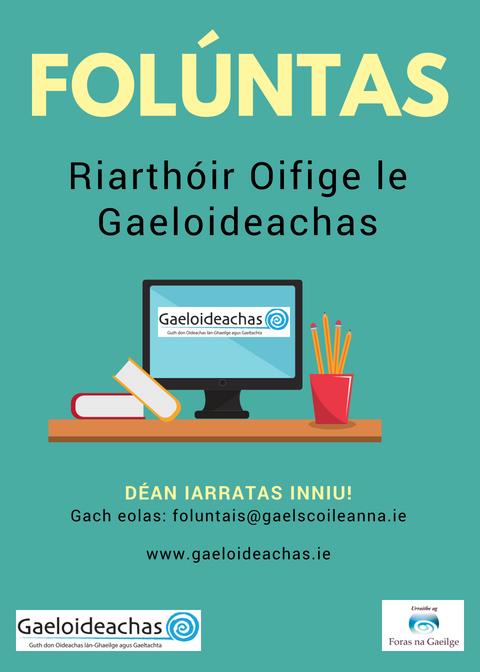 Beidh an ócáid seo, atá eagraithe ag Gaeloideachas i gcomhar leis an ‘Irish Research Network in Childhood Bilingualism and Multilingualism’, ar siúl i gColáiste na Tríonóide, Baile Átha Cliath ar an 3 Bealtaine 2018 óna 7-9i.n. agus tá fáilte roimh chách. Tá go leor buntáistí leis an oideachas lán-Ghaeilge in Éirinn do pháistí, agus le córais oideachais dátheangacha eile, ina measc cumas cumarsáide, litearthachta agus líofachta in dhá theanga, muinín agus braistint féiniúlachta níos láidre, gnóthachtáil chognaíoch agus oideachais níos fearr. Is buntáistí iad seo do gach páiste, do pháistí le riachtanais speisialta oideachais san áireamh. Faraor géar, bíonn go leor míthuiscintí maidir leis na cúrsaí seo agus mar thoradh air sin, ní fhaigheann páistí an deis tairbhe a bhaint as córas oideachais a bhfuil go leor buntáistí leis. Tabharfaidh na saineolaithe sa réimse seo a ndearcthaí ar na ceisteanna ar oideachas lán-Ghaeilge agus Gaeltachta, ina measc an tOllamh Ianthi Tsimpli (University of Cambridge); an tOllamh Padraig Ó Duibhir (Ollscoil Chathair Bhaile Átha Cliath); an Dr Ciara O’Toole (Coláiste na hOllscoile Corcaigh); an Dr Maria Garraffa (Heriot-Watt University) & Clodagh Ní Mhaoilchiaráin, (Príomhoide Ghaelscoil Bhaile Brigín – gaelscoil le dhá aonad neamhoird de chuid speictream an uathachais (ASD).